Do you have Anglican ancestry? Directories are a valuable genealogy resource for local, family and social historians, as well as researchers in other fields of Australian history. And if you're exploring your family history or building your family tree, they're a must! 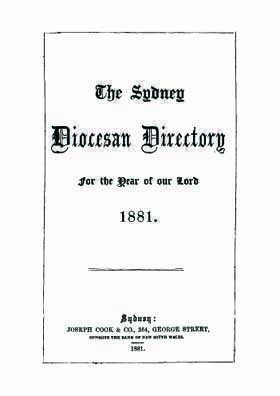 This set of Sydney Diocesan Sydney directories contains lists and details on all the Anglican clergy, cathedrals, committees, societies and schools of New South Wales as well as Anglican clergy lists for all other states in Australia. There are a total of five directories: 1881, 1886, 1888, 1893 -1896, and 1899-1920. Significant amounts of biographical information on those who held office in the Anglican church at this period of time are included.